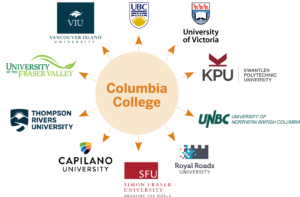 Take up to 60 credits at first and second year level at Columbia College and then transfer those credits to any university in British Columbia and across Canada. You will graduate with a degree from the university to which you transferred. Same courses and quality as a university. Columbia College instructors are personable and supportive with weekly office hours available to meet students requiring extra help. Small class sizes mean personal attention to each student and a closer relationship with instructors and classmates. Students will see a higher GPA as a result. Tuition fees are lower for the same courses as a university. 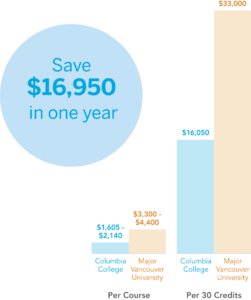 Columbia College charges the same tuition per credit, regardless of faculty. Students in Liberal Arts focus on social science and the humanities. The Liberal Arts program encompasses one of the widest academic areas, covering subjects such as Languages, Literature, Philosophy, Anthropology, Sociology, Asian Studies, Economics, Psychology, and Communications. Liberal Arts students complete from 30 to 60 credits before transferring to second and third year university programs. Columbia College offers a wide range of business courses, including Accounting, Corporate Finance, Management Science, Marketing, Statistics, and Organizational Behavior. Students may take 24 – 47 credits (one year) or 48 – 60 plus credits (two years) of Business Program courses before transferring to a university Business or Commerce degree program at the second or third year level. Columbia College University Transfer students intending to major in Business at the University of British Columbia (UBC) can transfer between 24 and 60 credits, making them eligible for either 2nd year (minimum 24 credits) or 3rd year (minimum 49 credits) studies at UBC’s Sauder School of Business. *Two English courses satisfy UBC’s English Language Admissions Standard (ELAS), but an external test (eg, IELTS or TOEFL) can alternatively be used to satisfy ELAS, as long as the required test score is received by March 15th of the year for which admissions is taught. At least one non-commerce elective (minimum 5 non-commerce electives required for 3rd year). UBC also requires submission of a personal profile and applicants must participate in a video interview. *ENGL 101 is strongly recommended as it satisfies SFU’s lower level writing (W) requirement for graduation. One of ENGL 100, 101 and one of 108, 110, 121, 131. Note: Students are advised not to take Columbia College’s 2nd-year business courses, as UVic requires that these courses be taken in year 3 at UVic. 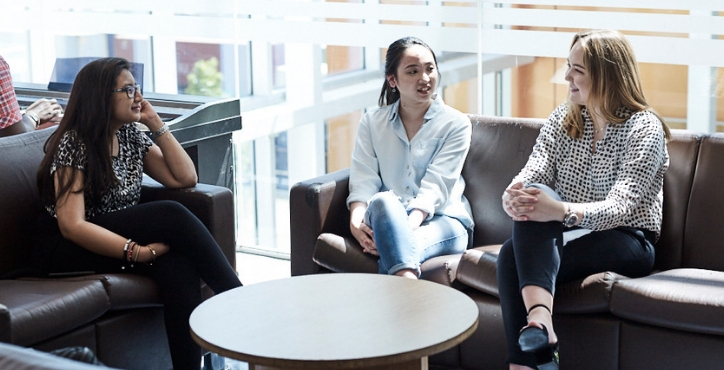 The University Transfer Communication Program is appropriate for students who wish to specialize in Applied Media, Public Policy, Telecommunications, and Marketing Research. Careers in Communications are numerous: journalist, editor, public relations expert, media consultant, advertising director, producer, film editor, media researcher, public policy consultant, media broadcaster. Students in a Columbia College Computer Science program take courses at the first and second year level and may then seek admission to one of several university faculties, including Science (UBC), Applied Sciences (SFU), and Engineering (UVic). 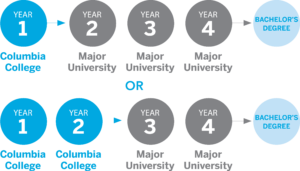 Specific course requirements vary among universities, but core first year courses are fairly standard. Admission to Computer Science Departments is highly competitive. As a result, alternatives to a degree in Computer Science are becoming increasingly popular among students who are primarily interested in the applications, as opposed to the theory of Computer Science. Students are advised to learn about related programs. Columbia College offers courses that are equivalent to those taken in the first-year Engineering (Applied Sciences) programs at the University of British Columbia (UBC), Simon Fraser University (SFU), and the University of Victoria (UVic). Students who complete the courses listed below qualify for a Columbia College First Year Engineering Certificate. Students interested in pursuing an Engineering degree at UBC, SFU, or UVic should consult a Columbia College counsellor (and also the specific university they wish to attend) in order to determine which of the courses listed below are required for the specific program in question. Students in the Science program can choose from a wide selection of courses including Chemistry, Biology, Physics, Computer Science, and Mathematics. Many courses are taught in science labs, enabling students to conduct experiments and get a better grasp of scientific theory. Students can complete between 24 to 60 credits before transferring to second or third year at a university science program.